I had been vaguely aware of websites for photographers that could highlight different areas good for photography. I did try one here in Australia but it didn’t have a lot of resources and I found it hard to interact with. Please put your hands together for SnapHotshot. 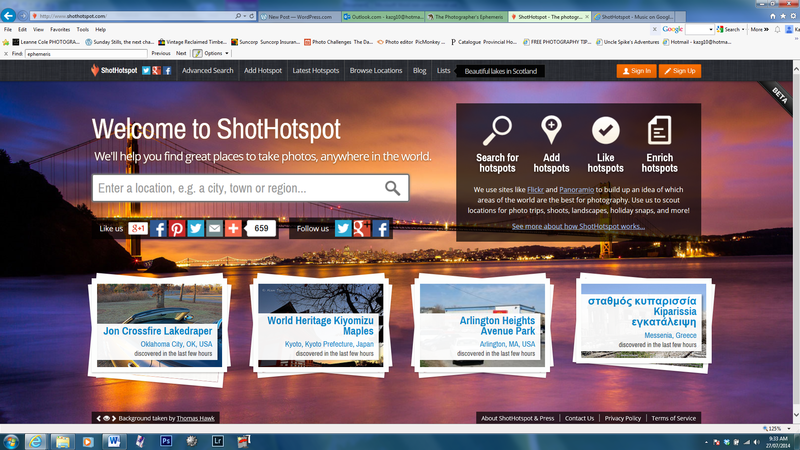 ShotHotspot uses Flickr and Panoramio to search for location all around the world. Users just type in the area they want to go to and what type of photographs they want to do and ShotHotspot finds photos of that particular locale and displays them for your perusal. Looks pretty good although I haven’t had a good go at it this morning. I was using my tablet and I found it a bit difficult to manoeuvre around but still okay. DPS photography has an extensive blog on this which you can find here by John Davenport, which is where I got the inspiration and information on this post. John also has a blog called Phogropathy which is full of informative information on anything photography. Sometimes its nice to be surprised by your surroundings and find hidden gems to photograph which is half the fun. On other occasions when you want to be more precise, ie you are going quite a distance away, you want to make sure it is a great photographic area. 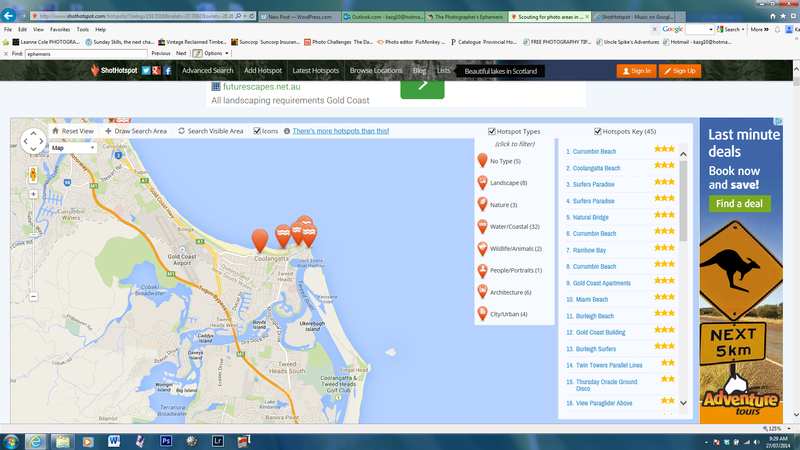 In this way ShotHotspot can help you decide more accurately where and when you go. It is also integrated with The Photographers Ephemeris which is a handy tool for sunrise and sunset times and other information on the area you wish to shoot. You can also add photographs to the site to assist other photographers. Would love to hear feedback from anyone that uses this website or knows of any other. I am only just sinking my teeth into it. I hope so Leanne, on just looking this morning I think its helpful for areas that you are not familiar with to get an idea. Sometimes I just like to go for a drive and if I know of a great area to shoot, then all the better. Makes for a great day out. This is the first time I hear about such website and I can’t thank you enough for blogging about it! I tried HotSpot, not expecting much, but it has very detailed information even about very obscure locations in my area! Thanks Mara for your feedback. I’m so glad you liked it 🙂 It seemed pretty good for Australia as well, the parts I checked on anyway. I need some time to go over it more thoroughly. Thanks Adrienne for your comment, I thought so too. Should be good for some day trips and/or holidays to get some good spots to photograph. I knew about the app but have not used it since I don’t travel much. I’ll look into it…sounds interesting. Thanks for this informative post. Thanks for stopping by and for your comment. Hopefully it might be of use closer to home as well as further afield. Interesting! I just searched my home suburb, and was amazed how many sites popped up (mostly by a small number of photographers). Given time, I will research more. Thanks for the hint, Karen. I hope it will be useful. I haven’t had a lot of time yet to look more thoroughly. Appreciate your comment.